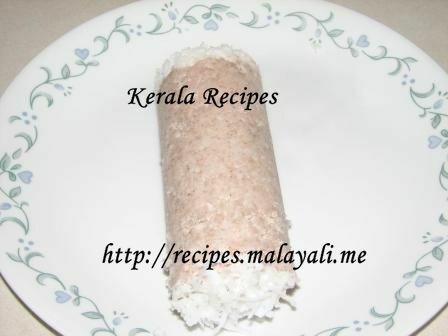 Puttu is a very famous Kerala Breakfast which is made using Rice Flour, Wheat Flour or even Rava. 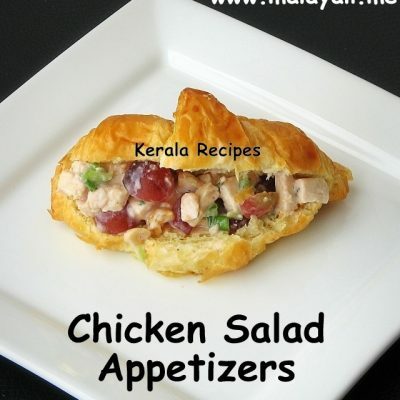 It is eaten along with sweet bananas, specially cheru pazham. 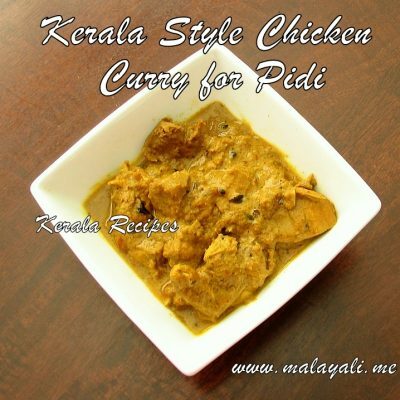 Some people prefer having Puttu along with Egg Curry, Kadala (Bengal Gram) Curry, Cheru Payaru (Green Gram) Curry etc. You can view the recipe for Rava Puttu here. Mix little salt in half to 3/4 cup of warm water. Mix 1/2 tsp of grated cumin and 1/2 tsp of sugar with the rice powder. Sprinkle water on the rice powder and start mixing it so as to make the powder wet. Keep on sprinkling water and continue mixing, till u can make lumps when you clasp but which can be easily crumbled. After the mixture has enough moisture, run it in a grinder for a few seconds so that there are no lumps. For making Puttu, there is a special vessel known as Puttu Kutti which is placed on top of another vessel called Puttu Kudam. Fill the PuttuKudam with water, not more than half its capacity. 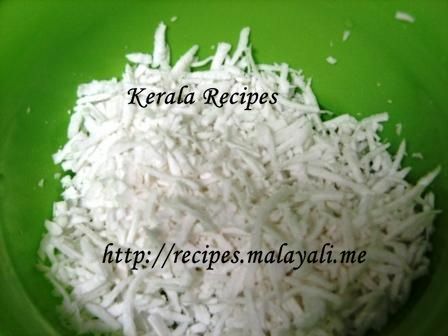 Place a handful of grated coconut in the Puttukutty (special utensil) and then add the rice mixture till half, now add another handful of grated coconut. Continue adding rice mixture and top it with some coconut. Close the lid and place the PuttuKutti on the PuttuKuddam and steam the Puttu for about 10-12 minutes. 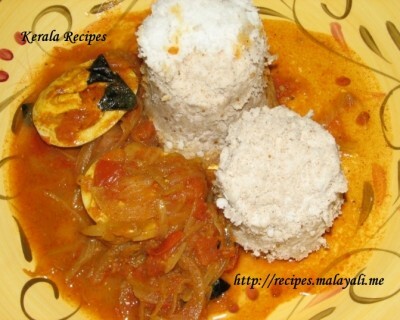 It is ready to be served with Mutta Curry or Kadala Curry or even with bananas. 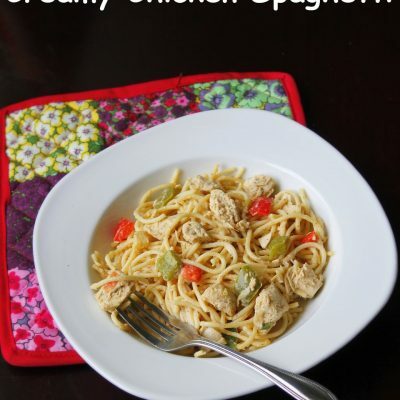 I added you to the food buzz. Whenever I make puttu and place puttu kudi on the tip of the pressure cooker. 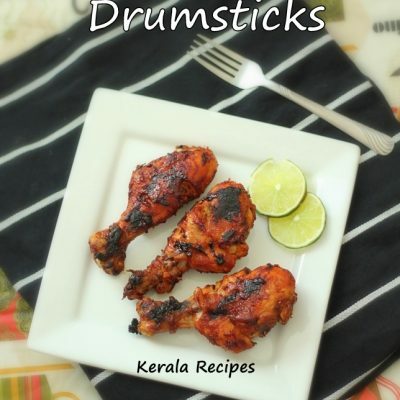 After making it, it broke into pieces when I push the stick to come out of the puttu kudi. Pls help me how to push it nicely to get cylinder shape like urs as seen in ur picture. Pls let me know for this 2 cups of rice flour, around 1/2 cup of water is sufficent to make it. The amount of water would depend mostly on the Rice Flour used. I use around 1/2 -3/4 cups of water for 2 cups of roasted puttu powder. And I guess, this will be sufficient for all kinds of rice flour. If the Puttu has been cooked well, it will not break when you push it out. So steam it for atleast 8-10 minutes. Hope this helps. May I know if it is possible that raw powdery-white fine rice flour bought from local groceries could be directly put or cooked in the steamer using 3-inches diameter tart mould? I mean is the rice flour can be cooked directly to the steamer without the need of being it mixed with water or any liquid? 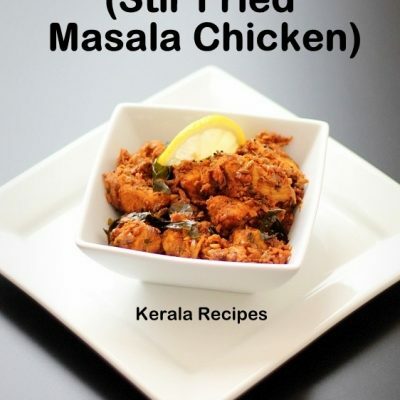 If so, what ingredients or powdery safe chemicals do I need to put or mix in the rice flour so that it can be easily cooked/done in less than a minute when directly place in my conventional steamer, without the need of soaking it in any liquid, like: water, milk, or coconut water? 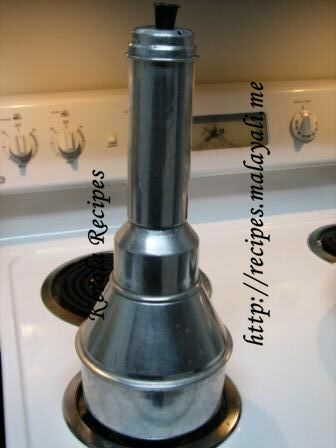 How to make the rice powder first? Without roasting, can we steam it? Rice Flour is roasted to increase its shelf life. 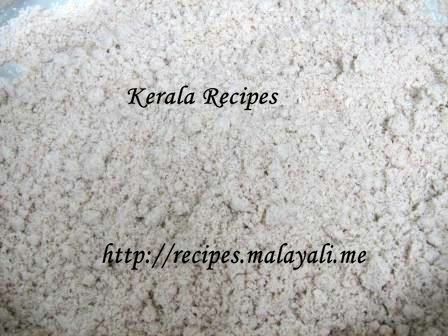 You can use unroasted rice powder for making Puttu. Most of the store-bought rice powders are not roasted and you can use it for Puttu. Hey there, any chances of making the puttu without the Kutti and Kudam? I don’t think I’ve seen any of the kutti och kudam in Sweden where I live. I ate puttu and banana on a holiday in Malaysia last month and I absolutely love it.